Yeah, October is here and the month of my favorite holiday! Halloween! Just a little snippet here about Halloween before we get into our holiday of the Month – Dia de los Muertos. Halloween was first a Celtic Festival called Samhain, the time when the ghosts of those who had passed were able to mingle with the living and the souls of those who had recently died were able to travel to the otherworld. Bonfires were lit to honor the dead and keep them away from the living as they made their journey. Today Halloween is celebrated by young and old alike. The creativity of making a costume is so much fun. I am not one for store bought costumes. I come up with my own (with the help of the internet, of course). Dia de los Muertos is celebrated in Latin America but most especially in Mexico. Dia de los Muertos is about honoring those who have passed. It is about celebrating their lives. Dia de los Muertos correlates loosely with All Saints Day and All Souls day which are minor Catholic Holidays and actually cross over with Halloween. During the holiday you will see calacas and calaveras (skeletons and skulls) decorated very colorfully. Last year Greer had their Halloween Party on November 1 so I painted a sugar skull or Calaveras mask on my face. Grave sites are decorated as are alters. Typical decorations are candles, buckets of flowers (wild marigolds called cempasuchil & bright red cockscombs), mounds of fruit, peanuts, plates of turkey mole, stacks of tortillas and big Day-of-the-Dead breads called pan de muerto. The altar needs to have lots of food, bottles of soda, hot cocoa and water for the weary spirits. Toys and candies are left for the angelitos (little angels/children), and on Nov. 2, cigarettes and shots of mezcal are offered to the adult spirits. Little folk art skeletons and sugar skulls, purchased at open-air markets, provide the final touches. 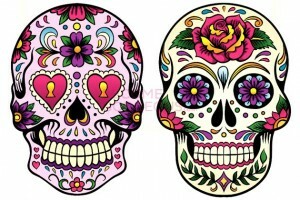 Sugar Skull Makeup Designs from BecomeGorgeous.com – Beautiful and great ideas for how to paint your skull (or your next Halloween costume)! Join hosts Nicole Martin and Jennifer Lynne Ziemann for a Dias de los Muertos celebration with art and meditation! Dias de los Muertos serves as a beautiful affirmation of the circle of life and death. It allows us to reconnect with ourselves as well as the spirits of our loved ones, helping us find acceptance in the impermanence of this very moment in this very life. We will begin with a meditation on impermanence, followed by painting and decorating our very own skulls in honor of our loved ones who have passed to the other side in celebration of their lives and spirits. We will end with a sharing of our work and who we honored. Refreshments will be provided. There is a limited amount of space so you will want to prepay ASAP to reserve your space. Thurs, October 2, 7:30-8:30 pm – Write On: from dream to page, write your path forward with Heather Marshall @ ARY. She facilitated a fabulous writing class for us last year. Can’t wait for this year. Check out my post about last year’s class. RSVP for this event on Facebook. Saturday, October 11, 1- 4:30 pm – ATS Style BellyDance Workshop with Discordia Arts @ ARY. RSVP for this workshop on Facebook. Saturday, Oct 11, 7:30-10ish – BellyDance Performance and Hafla (Party) with Discordia Arts and Friends @ ARY. We will also be having a Silent Auction this evening. So come prepared to support a great event and raise money for Safe Harbor. Cash and Check appreciated, Credit Cards if we must! ;) Remember every little bit helps. RSVP for this event on Facebook. Sunday, October 12, 4-6 pm – Survivors Finding Voice Lecture and Art Showing with Wanda Meade @ ARY. RSVP for this event on Facebook. Download our flyer to display at your business. And don’t forget we have drop boxes at Raspberry Moon and both Greenville Yoga locations to drop off items on Safe Harbor’s Wish List. Thanks! This video will crack you up! So if you need a good laugh and have a sense of humor about the Loo (British for Bathroom), check it out! 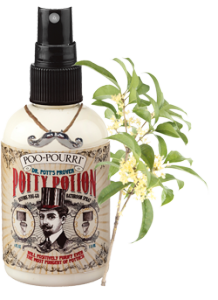 Pooetry: Will Positively Purify Even the Most Pungent of Potties! 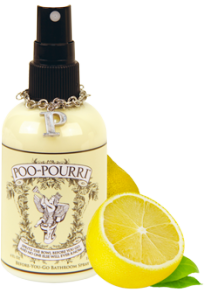 4 oz bottle of either scent is regularly $15, but save 15% through the month of October! Our holiday open house is Wednesday, November 19 from 5-8pm. 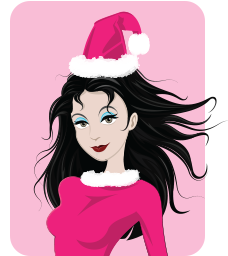 This year we have new and fun things for your gift giving needs and in all price ranges. So be sure to mark your calendar! You will be the first to see the new items and there will as always be yummy food, our famous Mexican Ponché (that delicious hot fruit punch), door prizes, and – of course – a nice little sale just for you! More details in next month’s newsletter!